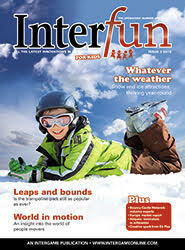 Launched to reflect the changing leisure patterns of families around the globe, InterFun is the must-read quarterly magazine covering all the latest innovations for children in the indoor play, edutainment, outdoor adventure, mini sports and simulation sectors. Available through a print subscription to InterGame magazine. To advertise within InterGame magazine please email susan@intergame.ltd.uk or call +44 (0)161 633 0100.